Scotland, Edinburgh: Edinburgh Assembly Rooms and Musical Society (designs for concert hall). Unfinished design showing a series of rectangular wall panels decorated with urns and arabesque work. You are here: CollectionsOnline / Scotland, Edinburgh: Edinburgh Assembly Rooms and Musical Society (designs for concert hall). Unfinished design showing a series of rectangular wall panels decorated with urns and arabesque work. Inscribed in ink in a contemporary hand Sketch for a great Room at Edinb. 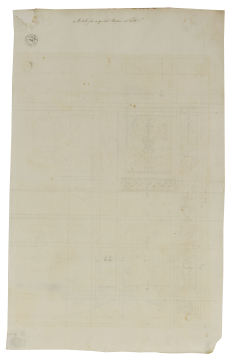 Unfinished design in pencil for a quadrant of the centre of a decorated ceiling. This drawing in James Adam's hand may be connected with the commission for a concert hall for the Edinburgh Assembly and Musical Society that John Adam was anxious to obtain in 1755 (see J. Fleming, Robert Adam and His Circle in Edinburgh & Rome, London, 1962, p.126). Such a scheme could well have involved James Adam at this time. There are other references to the Edinburgh Assembly Rooms in Adam vol.1/1, 3 and 4, of which 1/3 is inscribed Sketches of a Project for Edin'r. The scheme involved all the Adam brothers: Robert was involved in it with John before his departure for Italy, when James replaced him. Robert wrote from Italy in 1755 asking John to be told that 'I have been much on the observe with respect to concert rooms etc. But never have seen anything extraordinary in any shape as they perform mostly on the stages in play-houses . . . the few concert halls are quite plain without any coveing at all' (National Archives of Scotland, Edinburgh, Clerk of Penicuik Collection, GD18/4761). This interest may explain Adam's acquisition of a volume of theatre designs by Carlo Fontana (see A. Bolton, The Architecture of Robert and James Adam, 2 vols., London, 1922, II, p.330). There is another unfinished drawing by James Adam for the 'great room' in Adam vol.7/225, although this may be related to the casino designed for Robert Adam's house at 46 Lower Grosvenor Street, London (see A. A. Tait, Robert Adam: drawings and imagination, Cambridge, 1993, p.83-85).